The first time i tried alfredo sauce in the US I was truly disgusted disappointed. They told me about this famous italian dish i never heard about, and I was looking forward to try it. It turned it out to be a sort of Cacio e pepe (literally cheese and pepper) with a lot of unnecessary stuffs like cream, butter and something else undefined. So, here we are. 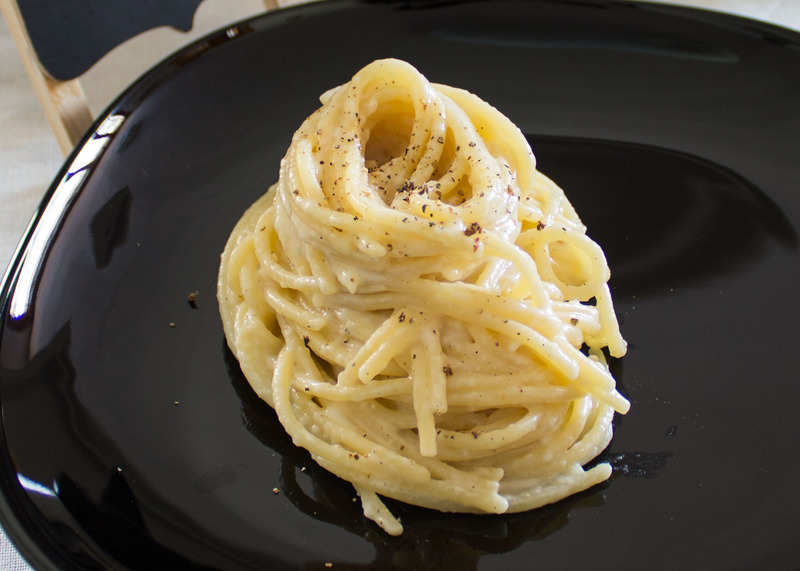 The real Cacio e Pepe. Also known as, there’s really no need for butter and cream to make something creamy. And good. This sugo requires literally 10 minutes if you are good enough with the grater. And just two ingredients, not counting pasta, pecorino romano cheese (again you can use grana or parmigiano, but you’ll lose something), and pepper. The ancestor of alfredo, or the Italian Alfredo. As always, put the water pasta on the stove to boil. Meanwhile grate your pecorino cheese finely. The finest the better. It will melt better later with the pasta of your chosen. I always prefer to freshly grate my pecorino to have it.. well, fresh (1). Besides, nobody knows what they put inside to the grated ones. Add 1/4 cup of room temperature water on it (3), and stir until you make a sort of paste (4). The maim part of the sugo is ready, you just need to cook pasta now. Stir the bowl again from time to time to keep the water mixed with the paste. Get a bigger bowl, and put it on the top of your pasta pot, to make it warmer. Once your pasta will be ready, you’re gonna drain it and put on the big bowl and you don’t want it to cool down too much (remember to save the hot water from pasta once you drain it, you might need it later). Once your drained pasta is on the bowl, stir it a moment to make it a little colder then add a spoon of paste. Stir. Add another spoon, then stir again. Then add the whole paste, and stir until you make a sort of slimery cream. If it’s not getting creamy or the pasta gets too cold, add a some water from the pot where you cooked pasta (you saved it, right?). 4. This is mostly the paste you’ll get. Well, you made a quick, healty, light and delicious pasta in probably 15 minutes or less. How does it feel? Do you still think alfredo needs cream and butter? Buon Appetito!! !